Come on, admit it. 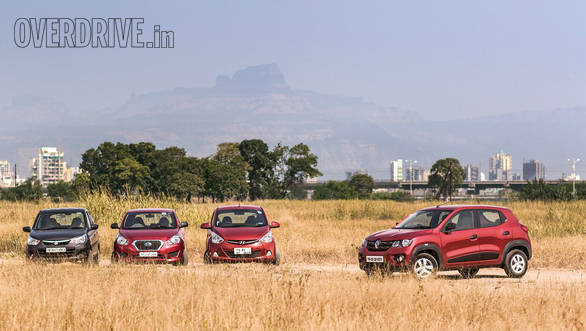 The moment you saw the Kwid being launched, you knew that a comparo was inevitable. Every day since the launch, we have been bombarded by queries about how the Kwid stacks up against its closest rivals. Of course, since we love our readers so much, we decided to go and find out. But hold on. The competitors in this test aren't exactly the round pegs for round holes that you might expect. There are no two ways about this. 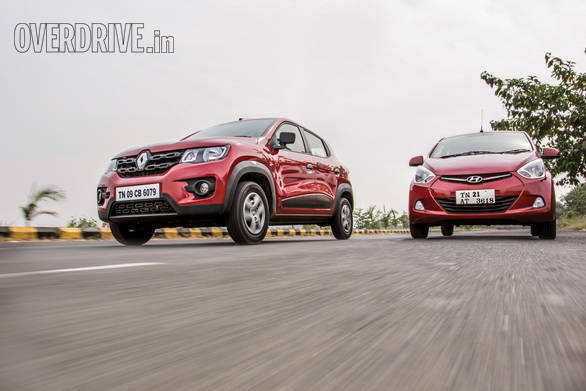 At first glance, the Kwid is the best looking car from among the four. It looks aggressive and bold contrary to the conventional cute ensemble the others wear. All the other cars now look a little dated. Mind you, they aren't bad looking cars. It's just that they've been around so long that we've gotten bored of seeing them. Except for the Datsun Go. If you ask me, the car has always looked like a mouse and it still does. This is not to say that the Kwid is without faults. For all its bulky haunches and rugged looks, there is one place where all the toughness falls flat  the wheels. The skinny tyres on those small wheels look completely disproportionate to the rest of the car. Also, when you start looking at the Kwid closely, you notice the reasons for that low price. There is a lot of cost cutting that has gone into it. The black side cladding, for example, is not actual plastic. Instead, it is a black sticker. The Alto on the other hand has never had this issue of feeling cheap. The problem with the Alto always was and still is that it looks a bit too boxy for my liking. Finally, the Eon. While it has become a bit too familiar over the years, it is still a smart looking car. The quality of materials is good and doesn't seem cheap at all. This quality is carried over to the insides of the Eon as well. The cabin is smartly designed and it is a pleasant place to be in. The materials are sturdy and they don't feel like they will break if you use a strong hand. 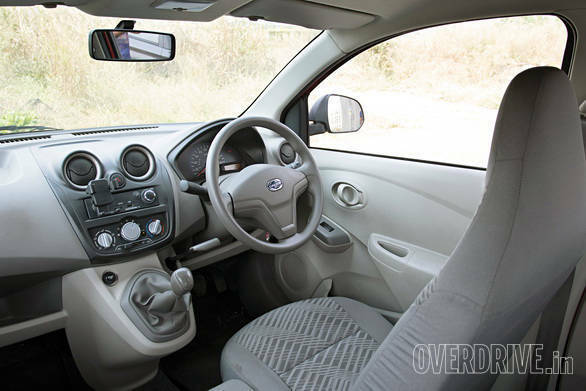 The Alto too feels quite sturdily built. It might not be as nice looking as the Eon, but it has everything you will need. 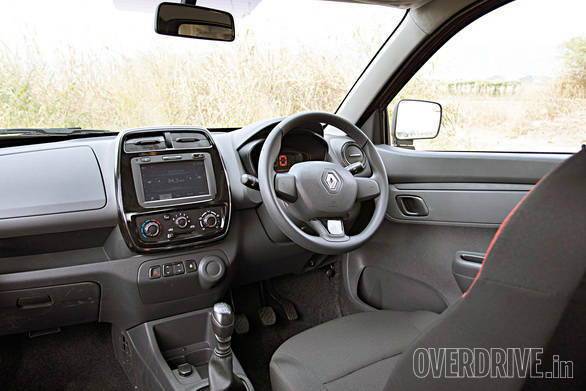 The Kwid has one of the nicest interiors of the lot. 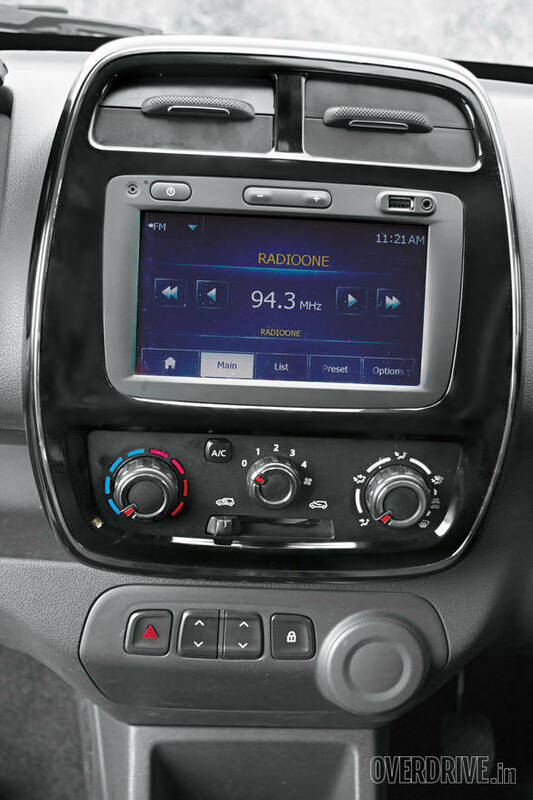 It has a compact steering wheel and the most high-end infotainment system among all the cars. The one problem that it has is that the materials aren't all that durable. 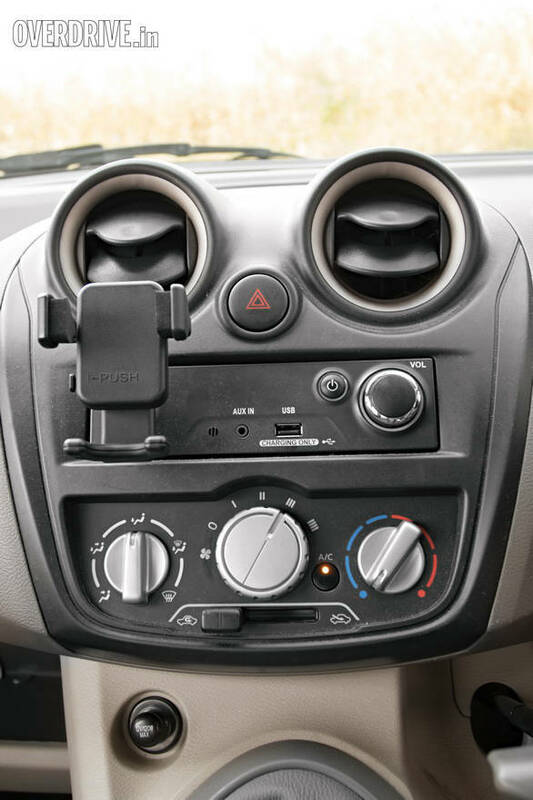 The aircon vents are quite fidgety and sometimes don't open or close. The top glove box has a latch that doesn't close very well and in the process of getting it to shut, we even managed to break it. But all this fades in comparison to the barren desert that is the Go's interior. I've really not understood why the Datsun's interiors are such rubbish. And now with the arrival of the Kwid, this is even more obvious. The bench seat at the front reminds of an old Fiat taxi and the on-dash handbrake lever just makes the entire cabin feel more like an old Qualis. It also irritatingly digs into your left knee. Even when you consider the Go being the most spacious for the rear passengers, the cabin still disappoints. The Alto is the worst off for the rear passengers. 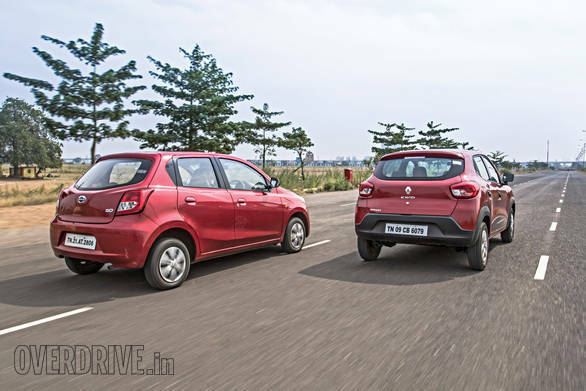 The Kwid isn't all that bad, but the Eon and Go are much better off. When you put all of this together, it is the Renault and the Hyundai that stand head to head at the top, followed by the Alto with the Go trailing far behind. In terms of sheer numbers, the Kwid has the biggest handicap here. 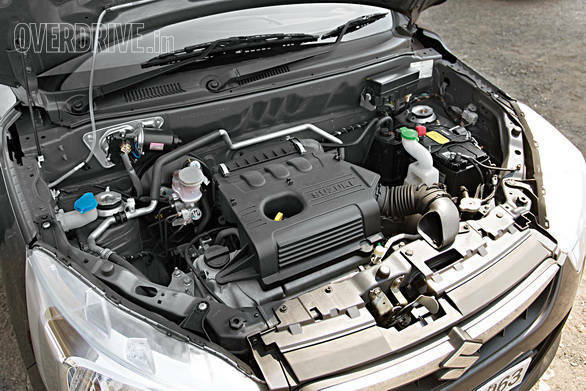 While the other cars have at least a 998cc engine, the little Renault only gets a 799cc, three-cylinder motor that makes 54PS and 72Nm of torque. In comparison, the Alto's 998cc motor makes 68PS and 90Nm while the Eon's 998cc engine makes 68PS and 94Nm. The Go, though, is in a league of its own with an 1198cc motor that makes 67PS and 104Nm of torque. However, despite this advantage in displacement, the Go is still unable to outrun the Eon in the sprint to 100kmph. The Datsun does it in 13.4 seconds while the Eon does it in 13.2 seconds. The 200cc that is missing from the Kwid makes it capable of only 16.4 seconds to 100 kmph. Meanwhile, thanks to the slow shifting AMT, the Alto can only do 15.5 seconds. A lot of the way these cars behave under hard acceleration has to do with their gearing. The Go should, theoretically, be the quickest of the lot. But thanks to the really short gearing, the car gains speed quickly from standstill, but loses steam once it crosses around 80kmph. This also means that out on the highways, the Go feels out of breath. The engine also isn't very well isolated from the cabin. This means that at high speeds, the cabin can get rather loud. The Eon, on the other hand, is so well geared that there is strong acceleration in all the gears. It doesn't strain to hold highway speeds and while initial acceleration is slightly lesser than the Go, it starts gaining velocity very quickly once it gets moving. With the additional 200cc that the Eon gains over its 800cc sibling, it also gets an advantage  refinement. 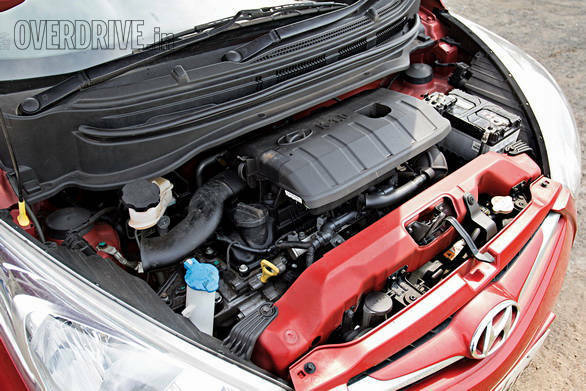 In comparison to the smaller motor, the 1.0-litre engine feels a lot more at peace despite being a three-cylinder. The Alto K10 is inherently a pretty quick car. But the AMT is aimed at delivering convenience while driving in the city rather than outright performance. This means that it isn't exactly the most exciting car to drive fast. It loses out on acceleration thanks to the excruciatingly long shifting delays. The engine is also really whiny at high speeds. But all that aside, there is just no denying the sheer convenience of an automatic in the city. Then there's the Kwid. 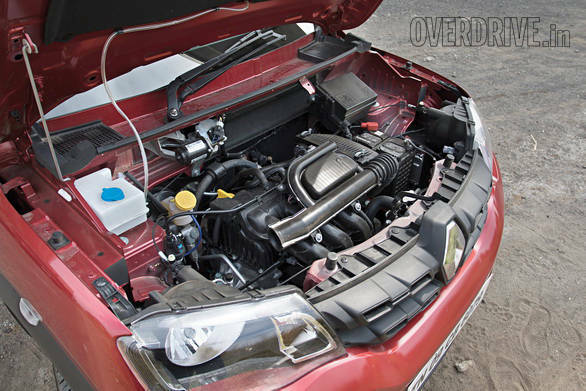 In the company of these larger engines, the Kwid's motor is just not able to keep up. When you step out of any of the other three cars and step into the Kwid, you will immediately notice the lack of punch. This is not a car that you want to take to the drag strip with the rest of this lot. 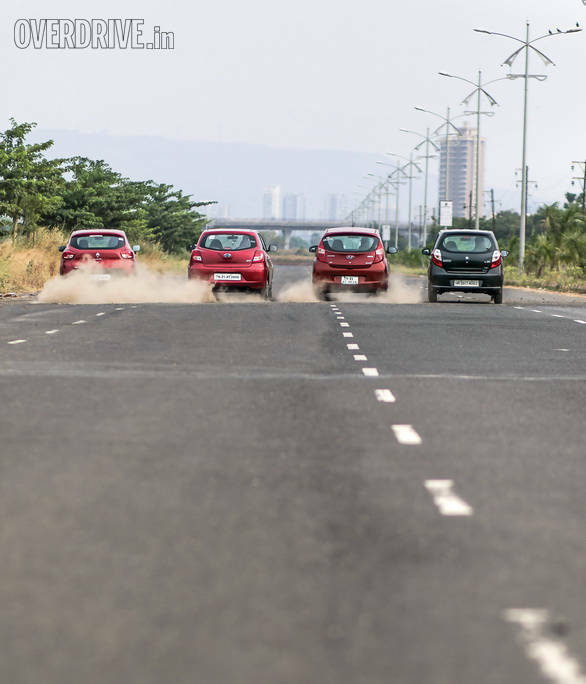 Everytime we launched the cars together, the Kwid just got left behind in the dust. All the cars here are built the same way. They are all steel monocoques with a MacPherson strut setup in front and a torsion beam with coil springs at the rear. But the way each of the cars is set up is a bit different. The common factor in most cars in this segment is that they all feel super light and flimsy. They all seem like they are always on the edge of traction and have EPS systems that have been engineered to reduce driving fatigue in the city. This means that all of them are light steering, zero effort cars. But when you look at them closely, differences do emerge. In terms of stiffness, the four cars are similar to each other. They are all sprung towards the softer side of the spectrum. The Kwid, though, is the worst of the lot. It is so softly sprung that it crashes through everything in sight. The steering is so light that you need the hands of a surgeon to make precise steering inputs. The same goes for the Go, only you can add blocks of wood instead of tyres to the mix. On the flipside, thanks to the super light steering, these cars do have distinct advantage over the Eon and the K10 in the city. However, seeing how much of an issue this light steering can be at higher speeds, the advantage is quickly negated. 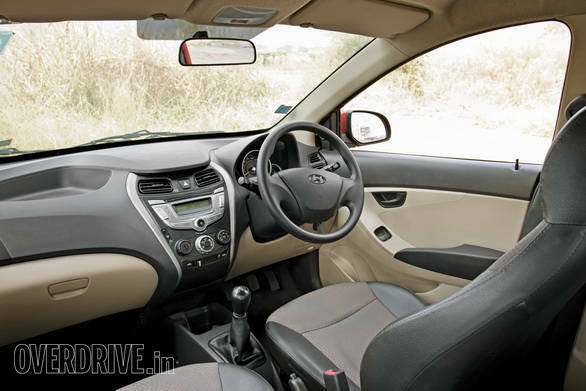 The Alto and the Eon on the other hand have a heavier steering feel, which helps with high-speed stability. And if I had to choose, I'd even say that from among the two, the Eon has the better overall package of ride and handling. 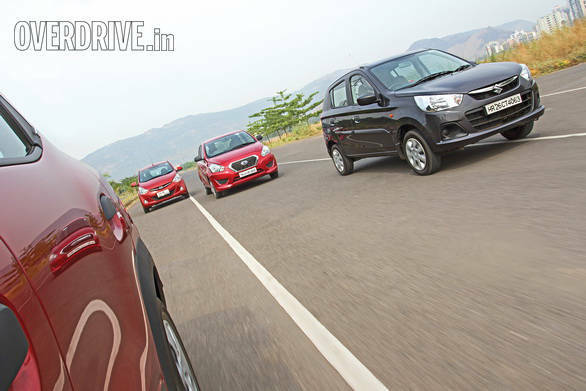 Between the Alto and the Eon, the Hyundai feels a bit better damped. It doesn't feel as crashy as the Alto. The Alto is a huge improvement over the Renault and Datsun, but the Eon is just a little better. The steering doesn't dance around as much and while it does feel dead, it never feels like a threat. The ride quality is refined and it handles bad roads with a lot more elegance. 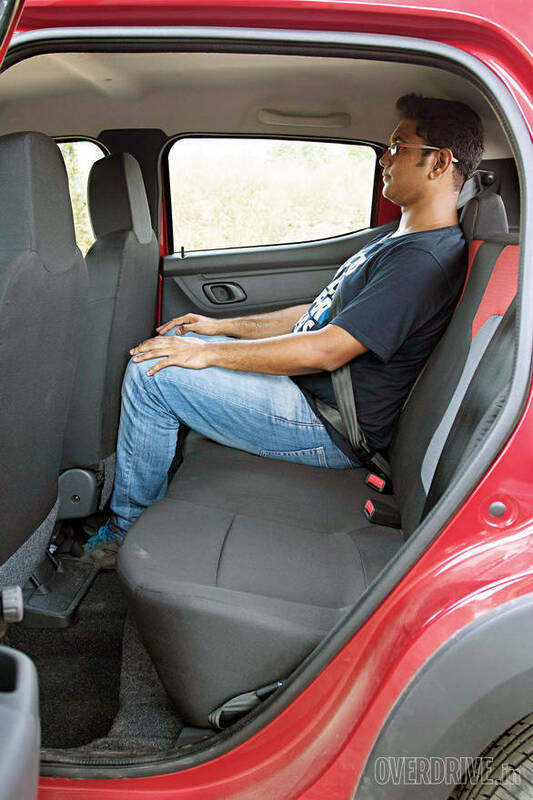 The Alto, while it doesn't transfer all the shocks and bumps to the occupants, lacks the peace and quiet the Eon offers. Let's look at the cars one by one. First, the Renault Kwid. From the outside it looks bloody brilliant. But the closer you look at it, the more flaws you will see. And the same goes for the inside. The cabin looks great, but build quality isn't and the refinement is pretty rubbish. The engine is very efficient but it isn't very quick. 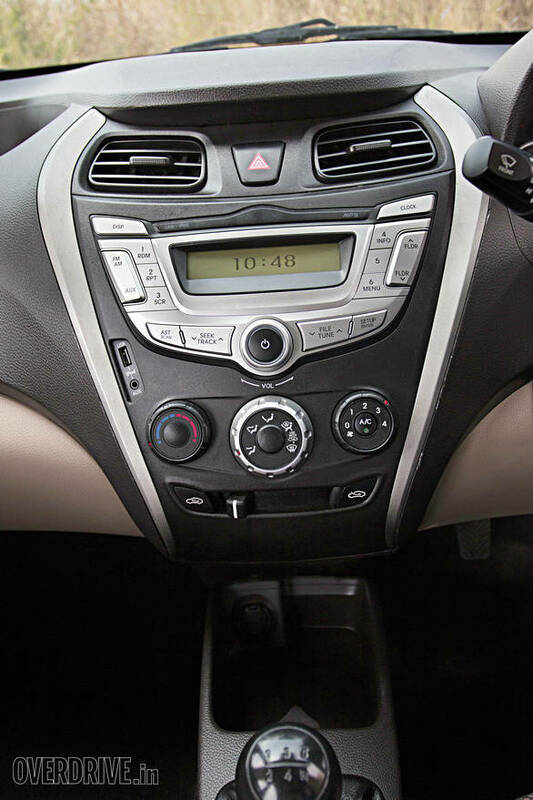 In fact the only things exciting about the car apart from the looks are the navigation and infotainment system and the optional airbag. Fully loaded, it costs Rs 4.51 lakh (on-road, Mumbai). Now, the Datsun Go. It has rubbish interiors and I'm quite surprised it even has an AC. It is a cheap car, but unlike every other cheap car, it doesn't try to hide it. And that's a shame. The exhaust, though, makes a fantastic noise and as long as you're not going very fast it is a lot of fun to drive. Where it scores over every other car here, though, is in terms of space. 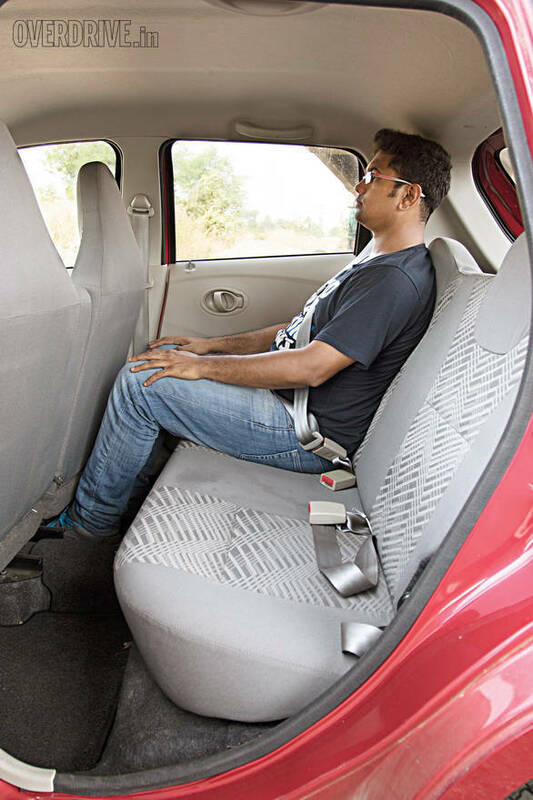 Being based on the Micra platform, it is the most spacious car here. And with the biggest engine of the lot, it is mighty quick too. Which explains why it's so popular in the hills. The Go too gets an optional airbag, but its biggest flaw is that it is not a pleasant car to be in. 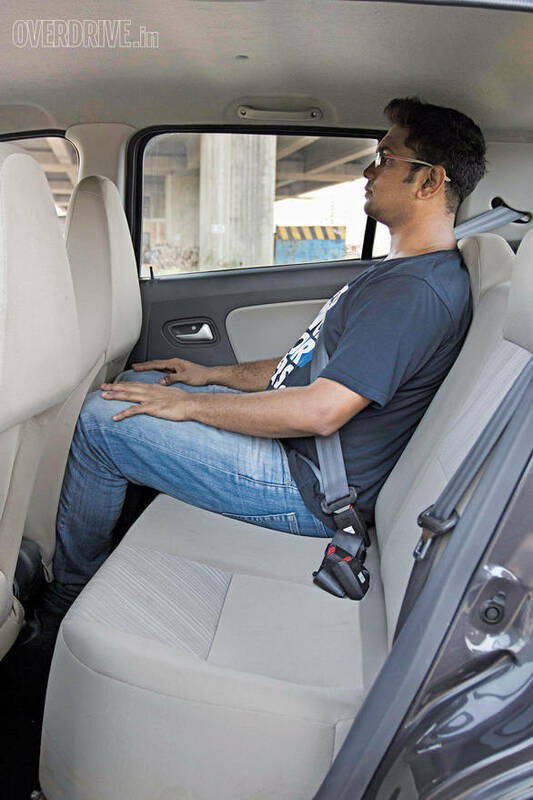 With the airbags, it will cost you Rs 5.10 lakh (on-road, Mumbai). The Maruti Suzuki Alto K10 is one of the highest selling cars from among the four. 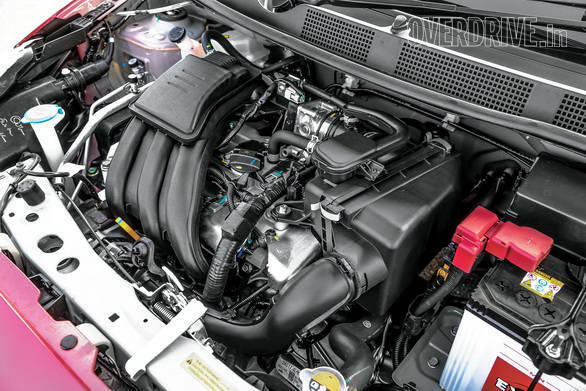 It has a powerful enough engine and even gets an AMT. For driving around in the city, this car is perfect. There are only a few drawbacks for the K10  the boxy looks and the lack of space. The interiors aren't that great either. 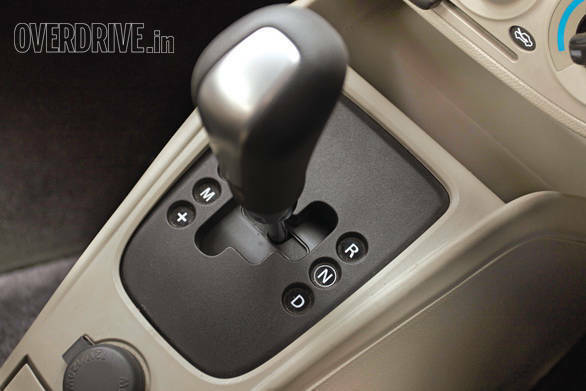 However, when you opt for an AMT, what you lose in the process is the option for an airbag. 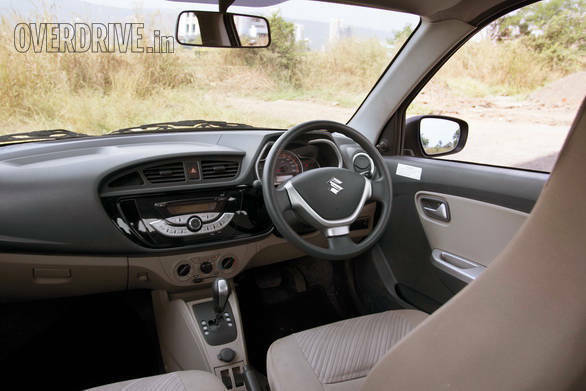 Maruti doesn't equip the car with an airbag in the VXi AMT trim, a really bad move. That said, it can be yours for Rs 4.92 lakh (on-road, Mumbai). Finally, the Hyundai Eon 1.0. It looks great and it's got all the bells and whistles that any of the other cars have. It gets a good looking design that still looks pretty, handsome interiors that don't fall apart, the quickest engine in the class, ride quality that is better than the rest, a steering that inspires confidence and excellent build quality  surprising for a Hyundai no? The car is also backed up by relatively low running costs and good service support. The only thing the Eon lacks is fuel efficiency. Then again, 16.9kmpl is bad only relatively. 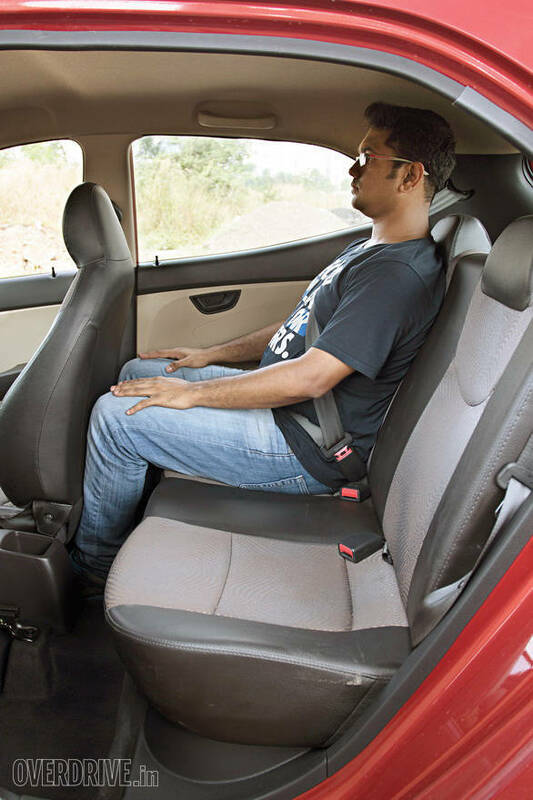 But the real cincher is that at Rs 5.13 lakh (on-road, Mumbai), the Eon is only Rs 3,000 more than the Go and Rs 22,000 more than the Alto K10 (which doesn't get an airbag, mind you). What I'm trying to say is, if I were to spend my money on an entry level car from among the four here, there is no need to guess which one I would choose. The Hyundai just makes so much sense overall.